Sitemaps are the maps which show locations of resources having by a website. What are the types of Sitemaps? Following are the types of sitemaps which are mostly used in websites. These are the sitemaps which are written in the HTML language. Below is a list of websites which provide online HTML sitemap generator service which is mostly & widely used. Below is the example of HTML sitemaps. These are the sitemaps which are written in XML format. What is XML site map generator? XML sitemap generator is the simplest form to allow Google to bring your website into the search engines. It also allows other search engines that your website exist in the world of internet and sends some crawlers to visit your website. The XML sitemap generators help the search engine optimizer to easily rank their website on number one by constructing some purposeful URLs that can be easily indexed on google. There are various platforms that allow you to generate URLs that help you and google and other search engines to easily crawl your websites. How to create an XML site map? Go to the browser and search GOOGLE WEBMASTER TOOLs. Click on the link of the Google webmaster. After that go to Sitemaps on the given Dashboard. There you will find a button where you will see ADD/TEST Sitemap written on it. Upload your Abc.xml or sitemap.xml file over there. But, keep one thing in mind not to upload any file above 50MB. Keep the thing as simple as possible. Creating large files might affect in indexing your website. So, create multiple XML files. First, you need to submit a sitemap on Google or other search engine platforms like Yahoo, Bing etc. so that the crawlers start working. After that create a file that contains all the plain list of your website sitemap having all pages listed in it. As soon as you are done with this now create an HTML sitemap file as HTML sitemap generator that allows the users or visitors to easily know where what is present or where they can find their respective material. What are the free XML sitemap generator tools? XML sitemaps is a website or platform that allows its visitors to create as many XML sitemaps as much they want without charging anything. Moreover, it also helps its visitors in working as an XML sitemap generator. For more info, you can visit their website https://www.xml-sitemaps.com/ to enjoy the amazing sitemap generation service. It’s totally free and secure. How to generate an XML sitemap for Wordpress? Install the WordPress script on your website. Now install the Yoast plugin to avail all the SEO services. As in WordPress default, the XML sitemap is not activated so you need to activate it first. After activating it will show a number of options now it’s up to you on which checkbox you are converting the checkbox on. Now your WordPress sitemap is finally activated. How to generate an XML sitemap for bloggers? If you want to create an XML sitemap for your blogger website then follow the following steps & you will be to create an XML sitemap for your blogger website. Open the sitemap generator by clicking on http://ctrlq.org/blogger/. Add a complete web address of your blogger site. E.g. : http://abc.blogspot.com/. Then, click on the “Generate Sitemap” button which will instantly generate the text of XML sitemap for your blogger site. Now go on to your blogger website dashboard and click on “Settings” button. 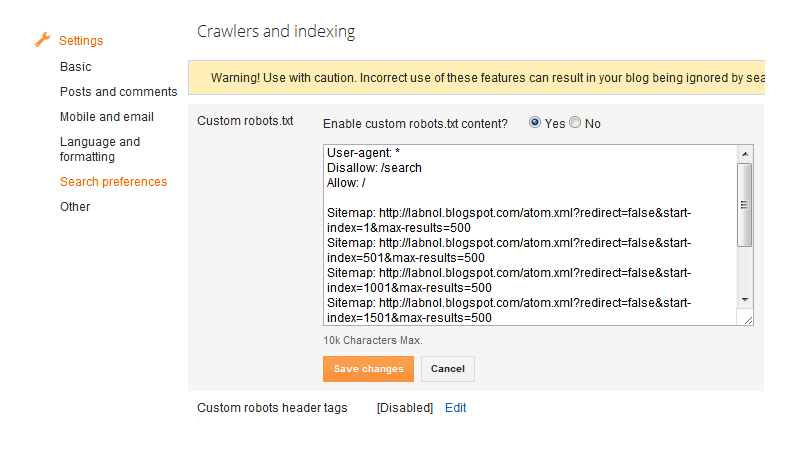 Under the “Settings” button go on “Search preferences” then enable Custom robots.txt (It will be available in the crawling & Indexing Section). After that, paste the generated text there and save the changes you have made. Now, it is all done. Search Engine will reach to your XML sitemap files automatically when you load your site via Custom robots.txt & you don’t need to manually ping them. Visual Sitemaps are the type of Sitemaps which are creative & interactive visually & anyone can understand easily. It displays content, site information & data analytics. What Are Free Visual Sitemaps Generator Tools? A best visual sitemap generator has the feature of generating sitemaps quickly and easily understandable by anyone. Following are some of the top visual sitemap generator tool available to generate visual sitemaps. XML sitemap generator is having many tools on the internet where you can generate different sitemaps. Just like that there are various online tools available to validate these XML site map to check either they are generated correctly or not. Basically, a sitemap validator work in a form of checking correctly XML sitemap generators generated and you have submitted the correct working sitemap to google. SEO chat is a platform that provides you free quality tools for validating your XML sitemap. In this, you just need to submit your sitemap and check whether it is generated correctly or not. A webmaster is a person who is responsible for creating & managing one or many websites. Webmaster world is a private forum service for professional webmasters by Google.